“We really would like to thank you for all this hospitality and the warm welcome and all the staff - we felt ourselves at home and we felt ourselves highly respected,” Kevork Jamkossian told Prime Minister Justin Trudeau. His wife held their daughter Madeleine, clutching a teddy bear the little girl took with a shy smile from Ontario Premier Kathleen Wynne as the politicians helped find suitable winter clothing for them. The family - the father is a blacksmith and the mother a sales clerk - was the first through processing in the wee hours of Friday morning after the government aircraft landed following a long flight from Beirut. The family fled Syria, spent eight months in Lebanon and now they came to Canada because here, Madeleine will have many opportunities, the family said. Trudeau and Wynne were on hand to welcome the first two families from the plane that brought 163 Syrian refugees to Canada. They were joined by the ministers of immigration, health and defence, as well as local mayors and opposition immigration critics. 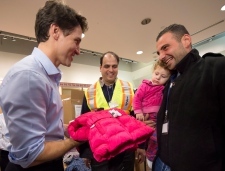 While there would be less fanfare for the arrival of the rest of the families, all were welcomed by a large contingent of staff at Toronto's Pearson International Airport and given winter coats, boots, hats and gloves before resting a few hours in a hotel. Shadr Mardelli struggled to put the day's experience into words. “I can't imagine my feelings here, I'm so happy,” he said, weary but smiling, minutes after arriving at the hotel with his wife and son. The family fled Syria for Lebanon last year. Starting Friday, 116 of the new arrivals will head to homes in the Toronto area. Another four will go to Windsor, Ont. Sponsors in Kelowna, B.C. will welcome four, three will go to Coquitlam, B.C. and one to New Westminster, B.C. Twenty are bound for Calgary, Alta., and the final 15 to Edmonton, according to statistics released Thursday by the Immigration department. 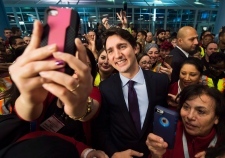 Trudeau told the assembled staff moments before the plane arrived Thursday night that those arriving would step off the plane as refugees but would walk out of the terminal as permanent residents with social insurance numbers, health cards and the opportunity to become full Canadians. “This is something that we are able to do in this country because we define a Canadian not by a skin colour or a language or a religion or a background, but by a shared set of values, aspirations, hopes and dreams that not just Canadians but people around the world share,” he said. 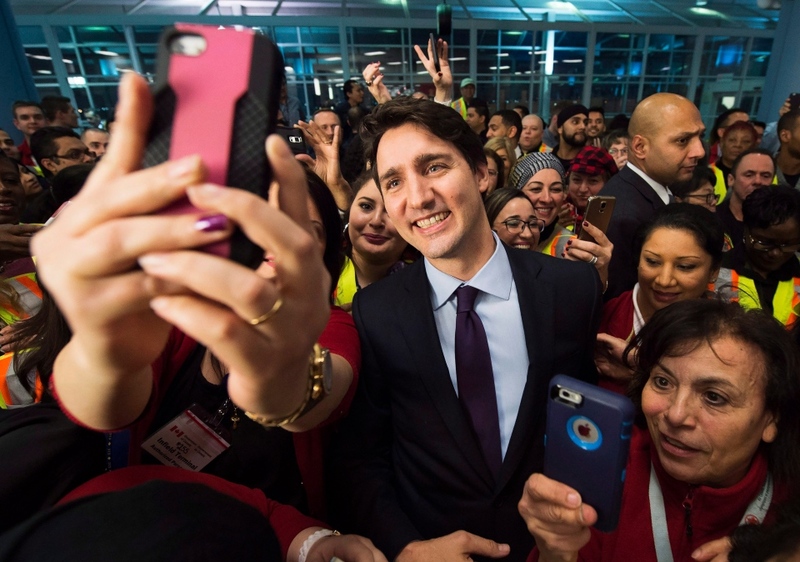 Canadians eager to show their support for the newcomers weren't deterred by the fact that they couldn't do so face to face. Stefania Dunlop and Lubna Altaher dropped off dozens of bags brimming with snacks and plush toys for the children, as well as hats and mittens for the adults. The pair said they had made arrangements with airport security to have the items -and several hundreds more bags - brought to the designated terminal where the government flight landed. Andrew Harris, 51, said he wanted to counter the fearful messaging about Muslims that has circulated since the Paris attacks. He held up a large yellow sign that read “Welcome to Canada,” saying that even if the arriving refugees don't see it, the positive words won't go unnoticed. 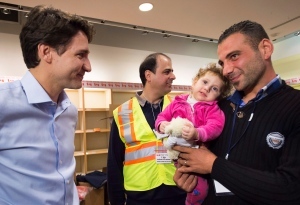 Syrian refugees arrive in Toronto.